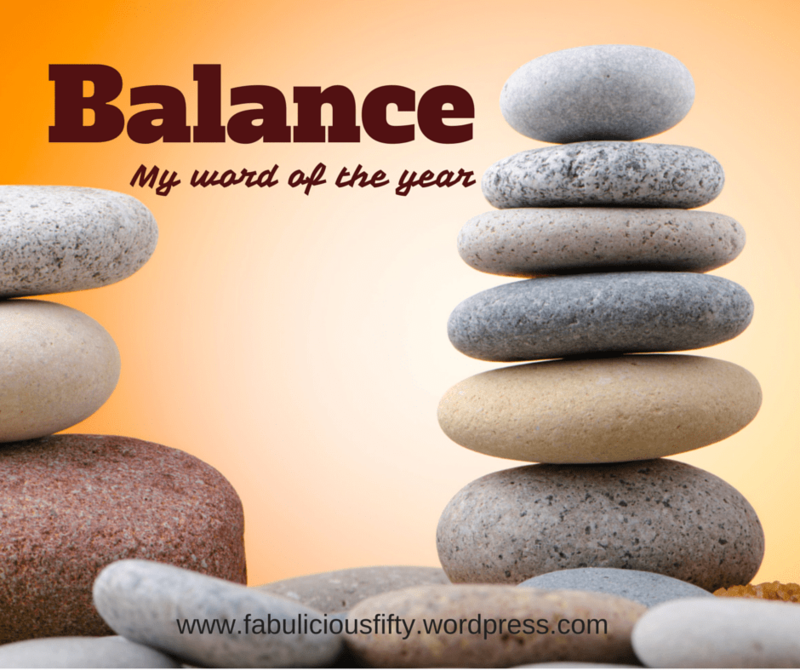 My Word of the Year Idea – Balance! I have always been the type of person to make new year resolutions, and to keep them as much as I can. At th end of 2011 I decided to upgrade this and choose a word for the year. A word to change my life, step at a time. I am proud to say that not only have I kept this up, but I have inspired many people to choose a word a year. This is going to be a series on my blog as I share my ups and downs and how this little idea has helped shape my life. Four year’s ago my life was in a dark place, and a little self reflection made me realise that my life was completely out of balance. Work consumed me, it even defined my friendships and leisure time. I realise now that I worked because it was easier to do this than think about the other areas of my life that were not under my control. My health was not good. I knew that I needed to improve my fitness levels, and yet didn’t have sufficient motivation to do anything about it. This was my first year with a ‘word’ and I had no idea how much it would change my life. Before I continue, I want to ask you to close your eyes and imagine me at the end of the year, in my walking gear, having returned from a walk and having a staring competition while standing on one leg with my son. I can’t remember who won, but it lasted for a significant amount of time. No matter what you read below, and in the rest of the series, I have dealt with it and worked to overcome and be positive in everything. And yes, there have been bad days and tears, but this is a positive story. The impact of the word ‘balance’ wasn’t anything dramatic to start with, I simply thought about my word, meditated on in and started to contemplate how I could incorporate more balance into my life. I was contemplating balance not in the physical way, but more in respect of priorities and emotions. However, be careful what word you choose. The first six months there were no huge changes, although I consciously started to put aside time for leisure related activities that were not work related. I explored new friendships and rekindled old ones. I stepped up my reading and looked for new interests and started an ongoing fascination with psychology. My world started to rock when I started marriage counselling early in the year. It was never really couples counselling as the counsellor quickly realised that the situation required individual counselling. There is a lot more to tell about that, but I digress. My doctor at the time always invited me for my birthday blood tests. An annual reminder to check up a few things. I have had an underactive thyroid for years and years, as well as some hormone issues, that needed monitoring. A week later I received a call asking me to come into the surgery urgently. I had pernicious anaemia. I had to google the word pernicious – I hadn’t a clue what it meant. (Not going to go into detail now, but it wasn’t good). Two weeks later I was told that I had Diabetes. A month after that I got Shingles in my eye. All this added to the emotional turmoil set me more off balance than I was to start with. I was really in a place where I felt as though I had no choices at all. I couldn’t see a way forward, and I felt myself sinking backwards. The doctor mentioned walking. I didn’t even own a pair of trainers! The first day I walked, it was on Spiddal beachfront and I walked with a kind friend who encouraged me and said how well I had done – I think that this was what would now be a 5 minute walk or less! Looking back it was the start for me. The start of change and getting balance in my life, in all aspects of my life, including physical. I have found writing this first post both positive and negative. I am proud to look back and look at my journey. I am also excited to consider what lies ahead. To follow my story, come back and visit my blog. I hope to put up at least three posts a month about my words. More on balance, and then change, discipline and create. « Fabulous Woman – #bizpartyinspires conference and the power of twitter!